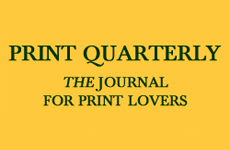 One of the most powerful attributes of the print, we are frequently reminded, is its ability to travel. Prints are how artists in Nuremburg knew what artists in Venice were doing; they showed John Singleton Copley in Boston what Sir Joshua Reynolds was up to in London. It can be easy to forget that, more often than not, this traveling is done along well-worn routes, and more frequently in one direction than the other. In the mid-20th century, Picasso prints bloomed in abundance on the walls of New York City co-ops, but Bellows prints were thin on the ground in Paris. This Spring we find two important exhibitions on two continents that aim to correct this imbalance for two different, far flung, parts of the world: the British Museum’s “Out of Australia: Prints and Drawings from Sidney Nolan to Rover Thomas” and the Museum of Modern Art’s “Impressions from South Africa.” Both come with substantial catalogues that will continue, long after the exhibitions are down, to act as essential references for anyone interested in the recent art histories of those nations, or more broadly, in the dynamism of print away from the globe’s familiar art centers. 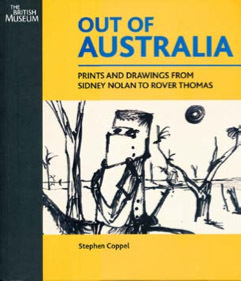 “Out of Australia” was put together by Stephen Coppel, the British Museum’s curator of modernist prints and drawings, who has previously published on American and British art (The American Scene: Prints from Hopper to Pollock, 2008), and is himself Australian. Like the MoMA show, “Out of Australia” is drawn entirely from the museum’s own collection, and it reflects a relatively recent flurry of collecting: since 2002 the museum has acquired than 880 Australian prints and drawings, and now claims to have the most extensive collection of Australian art outside Australia. No doubt those who are deeply familiar with Australian art of the past 50 years will find things to quibble with in the specifics of the selection, but for the majority of the global art audience this is new territory, and Coppel has accomplished a difficult task: condensing the art of half a century and all of a continent into a cogent critical narrative, while treating each artist as an individual rather than as an avatar of an art historical moment. The book is intellectually substantial and physically beautiful, providing full-page reproductions of works by some 60 artists, along with profiles of each; an introductory overview of the recent history of Australian art; a catalogue of all Australian prints and drawings donated to the British Museum; as well as a glossary and bibliography. 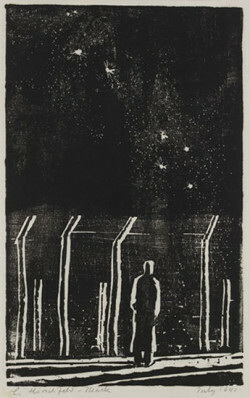 Ludwig Hirschfeld Mack, Desolation: Internment camp, Orange, NSW (July 1941), woodcut, 21.8 x 13.5 cm. Out of Australia picks up the story more or less where Roger Butler’s 2007 book, Printed: Images by Australian Artists 1885-1955, leaves off. Coppel’s brief introduction offers a nutshell history of Australian art and culture from the 1940s onward: the stultifying conservatism of its mid-century cultural institutions; the impact of the “Angry Penguins,” its self-styled, somewhat self-deprecating modernist avant-garde; the gradual development of a sophisticated art infrastructure; and finally the profound effect of indigenous artists over the past thirty years. Titled “Home and Away,” the essay emphasizes the degree to which the development of Australian artists has been characterized by isolation, both externally (before affordable air travel, the trip to the British cultural motherland took four to six weeks) and internally in a continent with the population density of Montana. The real story, however, unfolds through the profiles of the artists and the detailed accounts of the individual works reproduced. It begins with Australian-born artists such as Albert Tucker, Sidney Nolan and Arthur Boyd, who helped establish the very notion of an “Australian Modernism.” Though Boyd came from a family of professional artists, the others were autodidacts who learned their modern art from reproductions of European and American paintings, much as Copley taught himself through engravings. And like Copley, these artists seized their earliest opportunity to decamp for England; like Copley, they didn’t always come back. During World War II Australia, like America, benefitted from Europe’s tragedy through the diaspora of German-Jewish artists. Most of the refugees who ended up in Australia, however, had been deported from the UK as ‘enemy aliens,’ and printmaking was one the activities they took up in the Australian detention camps to which they were confined. 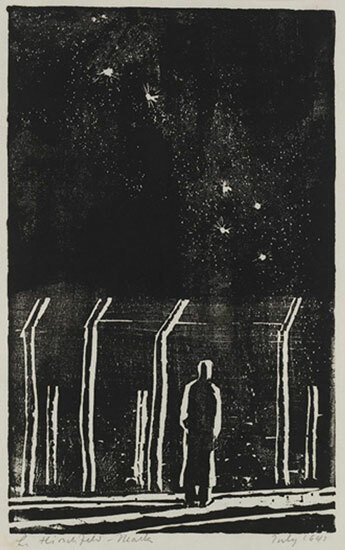 One of the most powerful single images in the book is Ludwig Hirschfeld Mack’s 1941 woodcut, Desolation: Internment camp, Orange, NSW, which shows a lone figure silhouetted by a barbed wire fence, gazing up at the wrong night sky. Artists such as Mack, who had been trained at the Bauhaus, changed art education in Australia, though many eventually returned to Europe. Fred Williams, Ferns diptych no. 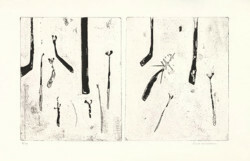 2 (1970), etching, aquatint and drypoint, 27.6 x 46.3 cm. Edition of 30. The Australian tabula rasa was a thing to leave behind, and through the fifties and sixties and into the seventies, the Australian art scene continued to operate as a kind of appendage to the British scene. Artists returned—if they returned—less because of Australian culture, than because of the landscape. This was the case with the painter and etcher Fred Williams, who had attended art school in Melbourne over parental objections, left for London in his mid twenties, learned to etch (beautifully) at the Central School, but returned to Australia after five years, where he found his work radically transformed by the nature of the terrain, which he began to depict through scatterings of fragmentary gestural marks. 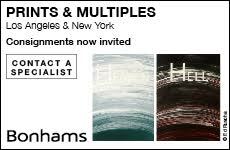 Williams stands out here for his non-narrative, non-expressive concern with the concrete specificity of the land. Australian art seems to have been remarkably attached to the figure: we move from the Surrealist-inflected figuration of Tucker, to the Expressive figuration of Charles Blackman to the Pop figuration of Barbara Hanrahan or Colin Lanceley. There is little abstraction; very little minimalism or conceptualism (Robert Jacks is the notable exception), very little “difficult” art of any kind. 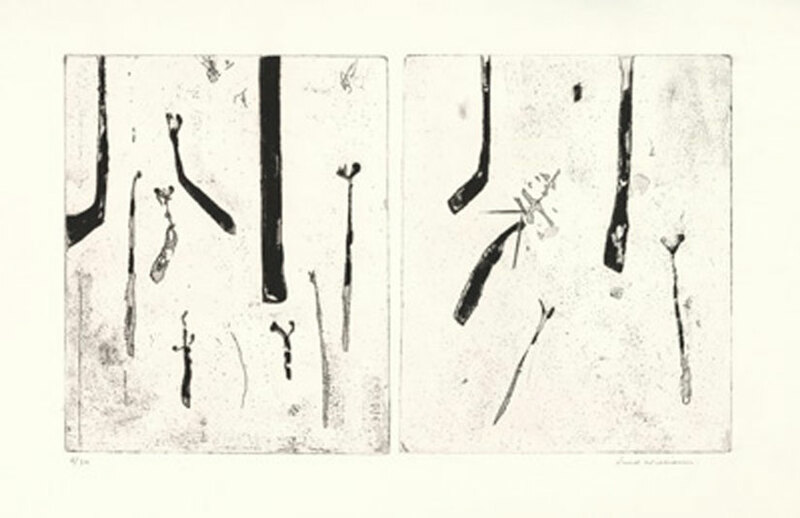 Judy Watson, Salt Water Country (1994), etching and aquatint, 59.5 x 22 cm. Edition of 30. The indigenous population of Australia was only granted full citizenship in 1969, but by 1990 the aboriginal artists Rover Thomas and Trevor Nickolls were representing Australia at the Venice Biennale. The transformation in the intervening twenty years was little short of astonishing. Aboriginal art enacts traditions that are thousands of years old, but it had previously taken physically ephemeral forms – paintings on bark or sand for example. When, in the 1970s, these traditions began to be put down in acrylic paint on board, they became physically accessible (if not conceptually comprehensible) to a non-indigenous audience. 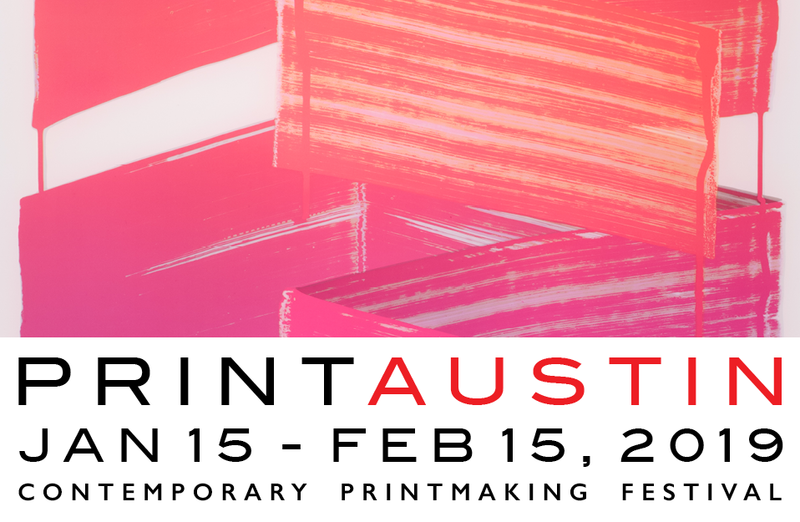 Printmaking, according to Coppel, “has emerged as one of the central practices of aboriginal artists,” and there is a strong affinity between printmaking techniques and the kinds of discrete, repetitive marks on a plane that characterize the work of indigenous artists. The book is perhaps overly optimistic in the depth of knowledge it assumes readers possess about the meanings, origin, and functioning of visual language in Aboriginal culture. For most readers, I suspect, these works are riveting in part because the logic of their structure is so opaque, while the beauty of the structures is self-evident. The rise of indigenous art has, Coppel observes, redefined the character of Australian art as a whole. It has confirmed something that seems to have been felt all along: a sense that the Australian natural environment is so inescapably different from that of Europe that living within it requires a different cosmology, a different visual language, a different understanding of space and time and human endeavor. But you can still use etching to express it. Out of Australia is what many books aspire to be—an education, an eye-opener, and an invaluable introduction to a new/old and old/new world.